PHOTO BY REBECCA PADULA Seneca East's Jake Forehand covers Mohawk's Austin Tusing as he looks to pass in Saturday's game in Attica. ATTICA — Mohawk got off to a good start with a 32-18 lead at the half and cruised to a 63-35 Northern 10 Athletic Conference victory. Zach Hayman led the Warriors (17-1, 12-1 N10) with 20 points, while Austin Tusing and Chris Klopp each added 10 points. Keith Jenkins and Kaiden Hammer both had seven points. Klopp recorded a triple-double as he also pulled down 12 boards and blocked 10 shots for the Warriors. Tyler Turek had 12 points for the Tigers (6-11, 4-10). They also got eight points by Andy Bauman. 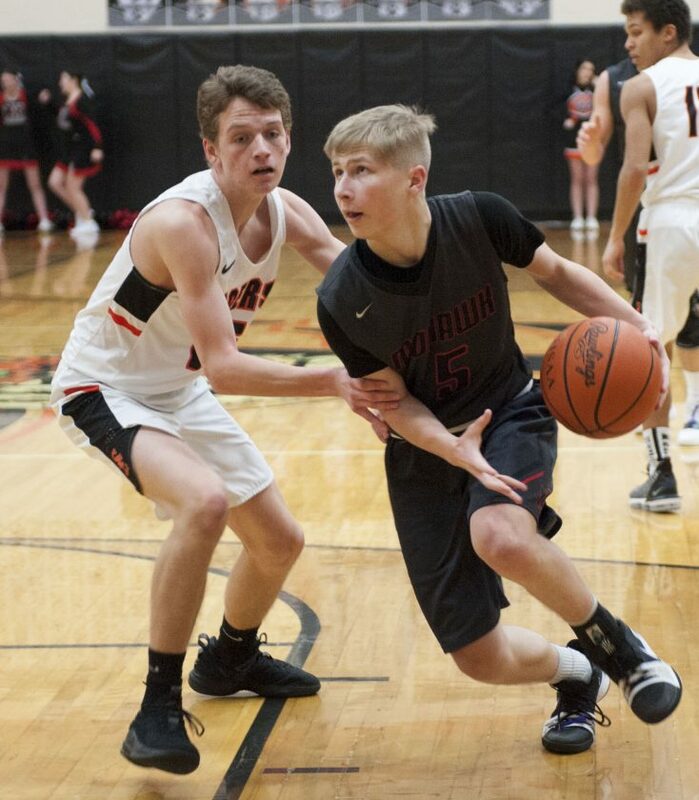 BUCYRUS — Upper Sandusky didn’t have any trouble scoring Saturday at Bucyrus as five players were in double figures in an 89-37 rout in Northern 10 Athletic Conference play. Upper Sandusky (14-4, 11-2 N10) led 26-9 after the first stop and led 50-21 at the half. Evan Young led the Rams with 17 points, followed by Cole Sowers (15), Mason Vent (13), Trevor Clifford (11) and Cameron McCreary (10). Harley Robinson-Koge led the Redmen (3-16, 3-11) with 13 points. CAREY — The 6-foot-8 Hayden Stone had his way in the paint against Buckeye Central with 26 points, 10 rebounds and seven blocks in a 67-49 win for Carey in Northern 10 Athletic Conference action. The Bucks (4-14, 3-10 N10) actually led the Blue Devils (10-6, 7-4) at halftime, 26-25, but a 23-6 third quarter lifted Carey to the win. Cade Crawford added 13 points for the Blue Devils, while Noah Babb had nine points. Darren Wurm registered 20 points and five rebounds for Buckeye Central, while Jake Heefner added eight points and five boards. CLYDE — Genoa’s Jake Plantz collected 31 points to lead the Comets to a 52-46 non-league win over Clyde Saturday. Genoa led throughout with a 29-25 advantage at the half and bolstered the lead with a 9-4 third quarter. Andrew Bench added nine points for Genoa (17-0). Cam Farrar led the Fliers (10-8) with 12 points, while Will Dowling chipped in 11 and Brock Newsome finished with seven. LAKESIDE — Old Fort had enough points in the first half to beat Danbury Saturday as it led 48-21 at the half and won 72-46 in Sandusky Bay Conference River Division play. The Stockaders got a boost with a 28-9 first quarter and rolled from there. Old Fort (13-5, 11-1 SBC) had 11 players score as Zach Dewese led it with 15 points, seven rebounds and four assists. Colin Nutter tacked on 13 points and Carson Steyer dropped in nine points and grabbed seven boards. Weston Miller snared three steals. Noah Stys led Danbury (5-14, 2-10) with 28 points. The Lakers were ice cold, shooting 26 percent (16-61) from the floor, including a dismal 16 percent (5-30) from deep.